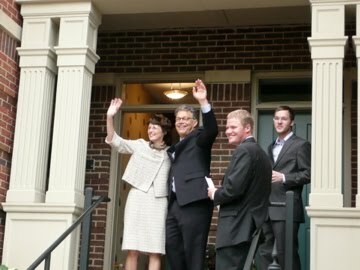 UMP | University of Minnesota Press Blog: A dramatic sequel to the 2008 MN Senate recount, you say? That's unlikely. A dramatic sequel to the 2008 MN Senate recount, you say? That's unlikely. BY JAY WEINER, author of This Is Not Florida: How Al Franken Won the Minnesota Senate Recount. "So," people are asking, "you gonna write a sequel?" "Actually," I reply, "no way!" The sequel, of course, would be about this incredible second potential recount in Minnesota within two years, this time for the governor's post. But there are major differences between 2010 and 2008. First, the gap. At this point in 2008, Al Franken's deficit was sliding toward 215. Today, Tom Emmer's is closer to 9,000. That is an enormous difference mathematically and politically. Secondly, the potential "mining" of absentee ballots has been eliminated by changes in the state election laws during the 2010 legislative session. We were told Wednesday that a mere 3,000 absentee ballots have been rejected out of 126,000 cast. In 2008, 12,000 absentee ballots were rejected, and eventually 1,347 were ruled to have been wrongly rejected. At that rate -- and I think we'll have fewer mistakes by election officials this time -- but at that 2008 rate, we'll have about 360 or so more absentee ballots to examine. And not all of them will go for any one candidate. For Republican Tom Emmer to "flip" this election, he needs a tsunami of found ballots or wrongly tallied precincts. I don't see that. So, this will become highly political. When will Emmer and the GOP realize that the votes aren't there? Will they try to game the system somehow so that a recount or court cases extend the fight into January, thus preventing Mark Dayton from being sworn in? I hope not. That would be over-reaching and would jeopardize Emmer's longterm political future and even the aspirations of Gov. Tim Pawlenty. Does he want to be the governor who worked to halt the clear path of democracy in Minnesota? But let's just wait. All the counties are doing their vote auditing beginning Friday, and for the next week. Let's see where this stands then. If Dayton keeps his lead in this 8,000 to 9,000 range, the pressure will build for Emmer to stand down. Democracy is a slow and deliberate thing. And that's good. This I know: No sequels from me on recounts. Mostly because I believe this 2010 rendition won't have the drama of 2008. Stay tuned this weekend as Jay Weiner's appearance airs on Book TV. His University of Minnesota Bookstore talk will air Saturday at 7 a.m. CT and Sunday at 5 p.m. CT.
For a review of events within the 2008 recount's 35-week-long run, visit www.ThisIsNotFlorida.com and click on the timeline infographic. You'll also find a discussion guide, a book video, and a link to the This Is Not Florida discussion on Facebook.